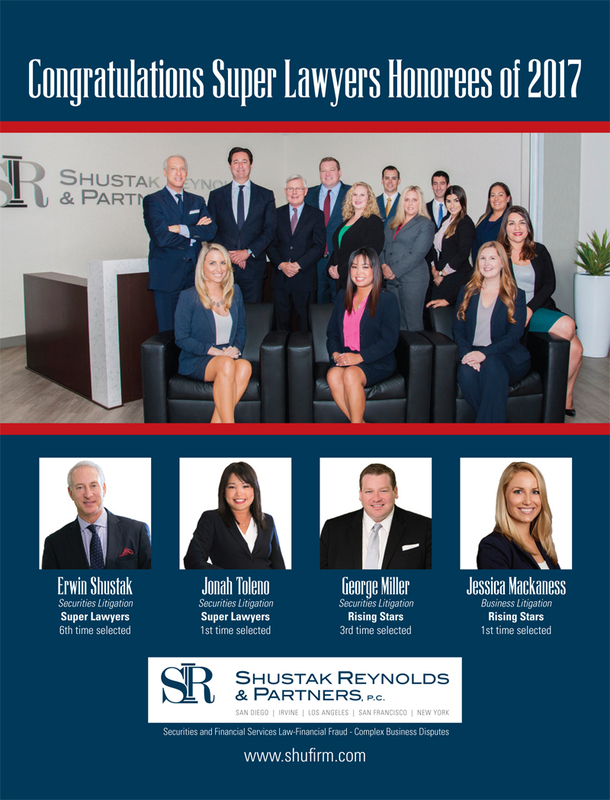 Meet Our Super Lawyers of 2017! We are pleased to announce that four of our attorneys have been selected as Super Lawyers for 2017. Partners Erwin Shustak (6th time selected); Jonah Toleno (1st time selected); and George Miller (3rd time selected) were chosen as 2017 Super Lawyers in the field of Securities Litigation. Associate Jessica Mackanass was selected for the first time in the field of Business Litigation. Super Lawyers is a rating service of outstanding lawyers from more than 70 practice areas who have attained a high-degree of peer recognition and professional achievement. The patented selection process includes independent research, peer nominations and peer evaluations. Super Lawyers Magazine features the list and profiles of selected attorneys and is distributed to attorneys in the state or region and the ABA-accredited law school libraries. Super Lawyers is also published as a special section in leading city and regional magazines across the country. Lawyers are selected to a Super Lawyers list in all 50 states and Washington, D.C.